Use of e-cigarettes is on the rise, leaving scientists wondering what effects they could have on the developing brains of young people. A team of researchers from the FIU Center of Children and Families (CCF) have been awarded a $2.1 million grant from the National Institutes of Health (NIH) to investigate the effects of e-cigarettes, vaping devices and other electronic nicotine delivery systems on adolescents. Led by Elisa Trucco and Matthew Sutherland, the project is one of the first studies to examine the impact of e-cigarette-use on the developing brain. “Although there is convincing evidence that these products may be useful tools for adults who regularly smoke cigarettes to cut-down their use, adolescents are vulnerable to adverse effects of nicotine because their brains are still rapidly developing,” said Trucco, an assistant professor of psychology at CCF and the director of the Research on Adolescent and Child Health (ReACH) Lab. The team is also investigating whether e-cigarettes are gateway drugs that could lead to use of other substances including regular cigarettes, marijuana or illicit drugs. Although cigarette smoking has declined among Florida youth in recent years, use of electronic nicotine delivery systems has sharply increased among high school students — as much as 410 percent since 2011. 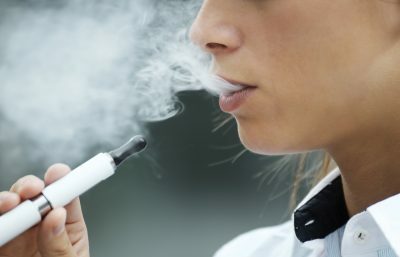 Approximately 300 teenagers will be recruited and followed over three years to determine risk and protective factors associated with e-cigarette-use; identify factors promoting the shift from e-cigarette products to cigarettes and illicit drugs; and determine negative health effects of these products on the brain using magnetic resonance imaging. The grant is part of a $13.1 million grant from the National Institute on Minority Health and Health Disparities (NIMHD) to the Robert Stempel College of Public Health and Social Work. For more information about the ACE-Project at FIU please call 305-348-8426 or email etrucco@fiu.edu and masuther@fiu.edu.